In an effort to make it easier to add intelligence to smart home gadgets and other network edge devices, Intel has launched the Neural Compute Stick 2 (NCS2) ahead of its first AI developers conference in Beijing. Edge devices generally refer to any piece of hardware responsible for controlling the flow of data between the boundaries of two networks. In addition to routers, switches and gateways, they also include IoT devices such as smart doorbell cameras, smart medical devices, industrial robots and self-guided camera drones. 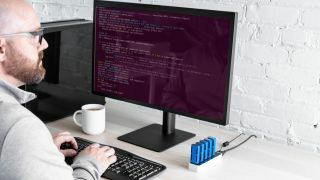 Since Intel's NCS2 is a self-contained neural network on a thumb drive, it will make developing these devices much easier and faster since the onboard Movidius Myriad X vision processing unit (VPU) can provide the processing power needed to train them. Now developers will be able to use a laptop or any system that can run Linux to create AI algorithms and computer vision systems locally without the internet. The only requirements are that their system is running a Linux-based OS and that it has a USB 3.0 port to plug in the NCS2. Intel's new NCS2 is apparently eight times faster than its predecessor and the chipmaker has provided a handful of developers with the new device for testing. So far they have developed a variety of useful applications including Clean Water AI which uses machine vision and a microscope to detect harmful bacteria in water, BlueScan AI which scans a patient's skin for signs of melanoma and ASL Classification which can translate American Sign Language into text in real-time. The NCS2 is available directly through Intel for just $100 and multiple sticks can even be used simultaneously for more demanding tasks. The device is not only available to researchers but also to the general public so anyone can begin adding intelligence to their IoT or edge devices.